It was with excitement and trepidation that I watched Star Wars with my two daughters (aged 5 and 6) for the first time this week. I had been waiting 6 years for this moment, but at the same time I was nervous that one or both of them would hate it. Luckily, both were enthralled. And even though the original trilogy is light on strong female characters, it makes me happy to see my daughters flying their imaginary space ships and having light saber duels. Shortly after watching Star Wars (A New Hope), we moved on to The Empire Strikes Back and Return of the Jedi. We only watched Empire once (they didn’t like how well the bad guys faired), but we’ve watched Jedi over and over. Maybe it has something to do with the deep and meaningful culmination of the struggle between the dark and light side of the Force. Or maybe it’s because they love the Ewok song. But during our first viewing of Jedi, the scene with Jabba got a little intense. I didn’t want the girls to get scared (and risk never watching the movie again). 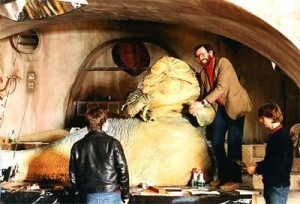 Luckily I was quick on my feet– “did you two know that Jabba the Hutt is actually a 2000lb puppet with six people moving it around?” Their eyes widened. “Really?” they chimed in chorus. I knew we were in for some fun. I paused the Blu-ray and Googled for more details. We spent the next 20 minutes learning everything we could about how Jabba worked, what George Lucas had to do to sequence the space battles, how much time and effort the crew put into all of the models, and even how Jabba was CGI’d in to the Star Wars remake. It was awesome! And though it broke our suspension of disbelief, it alleviated any fears the girls had, and taught them to go from passive consumers of the movie to active watchers.